Suppose you need Excel to do something beyond its normal capabilities, or just do something automatically to save you from hours of tedium. The answer is often a VBA procedure, or “macro”. You’re not a programmer, you don’t know a macro from a mackerel, so what do you do? You could ask a colleague, you can Google for help, you can ask on a forum or newsgroup. And the answer is, “Use this macro.” Oh boy. Now what do you do? 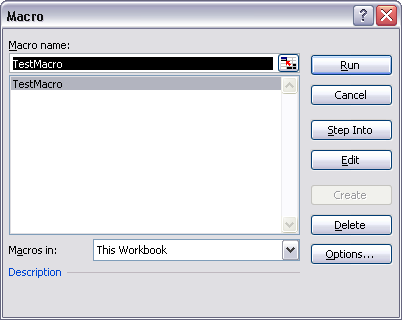 Let’s put the macro into your workbook and try it out. We’ll use the following simple macro for this exercise. Find your workbook in the Project Explorer window. By default, the Project Explorer is docked along the left edge of the VBE window. If you don’t see it, activate it from View menu > Project Explorer. Note the treeview of the workbook. 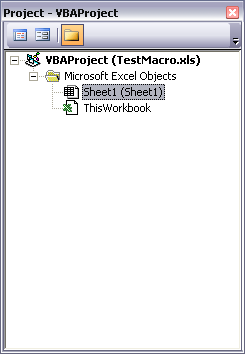 The top level is the VBAProject, with the workbook name in parentheses. Under that is a folder entitled Microsoft Excel Objects. 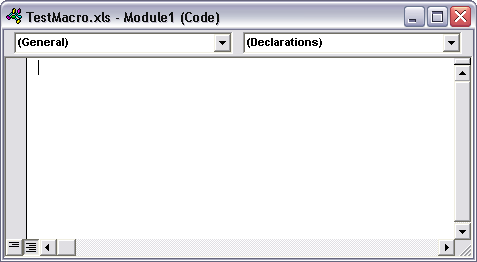 Within this is an element for the workbook (ThisWorkbook) and for the worksheet, with the sheet name in parentheses. There would be an element in this list for every worksheet and chart sheet in the workbook. We need to insert a code module. This is easy: Insert menu > Module. 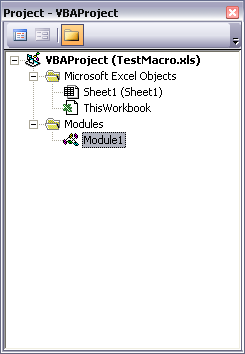 A new folder, Modules, has opened under the VBAProject entry in the treeview, and an item called Module1 appears in the folder. A blank code module window has opened in the VB Editor. 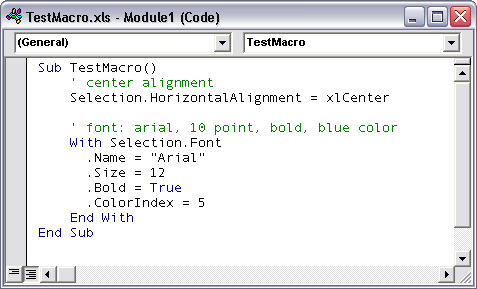 Copy the macro code from wherever you found it, and paste it into this window. Red text indicates a syntax error, so you will need to figure out what’s wrong. Often it’s just a problem with line wrapping in email or on a web page. Posted: Sunday, March 9th, 2008 under VBA. Excel’s object model is a bit quirky and it’s implementation of OOP seems to be lacking, where is the material on that stuff? 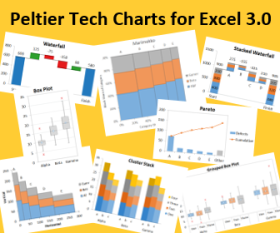 Derek – Charting was the last area of VBA I got into. There was something scary about it. Or that I was losing control. But I got over it, got into the branch of the object model that dealt with charts, and despite some funny business there, realized it’s really no different that the rest of it. Dan – The advanced work is not readily available as tutorials. The examples in advanced Excel VBA is there, but hard to find. You might find it useful to expand your search to VB6: those resources are still available despite dot-net having taken over. There are a small number of advanced books. Walkenbach’s books range from beginner to more-than-intermediate, while advanced topics and details are found in the Excel VBA Handbook series and the seminal Professional Excel Development (look for authors Bullen, Bovey, and Green together, and occasional others). Just to be clear, I wasn’t saying I’m new to VBA as it applies to charts. I was saying I’m new to VBA, period. Derek – VBA isn’t too tough. The macro recorder (see the next post) gives you much of what you need, then it’s a matter of fiddling around, or using Google, to make it do wyat you need. Derek, believe me, I am not a programmer, and I don’t go much beyond the examples above, but once you start automating some tasks with recorded macros you will not turn back. There are many things that you simply can’t do without VBA (like stupid and repetitive tasks and user interfaces). Note to self: blog about how I got started with Excel programming. Jorge – I’ve heard it said that laziness is the mother of all inventions, which may be true. I know for me, laziness is why I got started programming. Back in the old days of Excel 4, I had this technique I used to model material deformation behavior, and it required iteration between two Solver loops, one for loading and the other for unloading. You had to run alternative Solver simulations on each part until the difference between them was less than some small acceptable error, which meant probably a total of a dozen or so Solver loops, and you had th change all of the constraints and target cells and changing cells each time. Then repeat for a total of a dozen cases. So let’s say 144 Solver loops, each set up manually. This took more than half a day to do by hand, and it was tedious as hell, almost as tedious as this description. Anyway, I spent a couple weeks in Excel with the XLM manual in my lap, and I automated the sucker, and finally it ran in about two minutes. When I got Excel 97, this was my first VBA project, and it was hard, but I got the time down to ten or fifteen seconds. There was no turning back. Thanks for the pointers (no pun intended) Jon. I m in need of urgent help! -source date and reselect all the cells for each individual cell. Is there away to have the graph read only the cells vs sheet + cells? Following guidelines in Getting Answers For Your Excel Questions, please submit your question to a dedicated Excel forum.